My last blog was about the new book club I joined and how I was going to jot down my thoughts and opinions on the different books we read each month. I am going to add an addendum to that statement. I will also, on occasion, blog on books I really, really think you should read. My first book I am going to highly recommend is from a new up and coming star in the world of authors. His name is Cliff Jones and I am so very privileged to have him as a friend. He just published his first book back in February, 2015. The book is called “Water Runs Slow Through Flat Land” and it is based on the marriage of our world and media news. The story follows an online journalist as he travels into ‘hostile’ territory in search of a story. 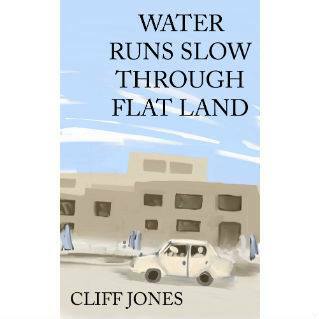 I give Water Runs Slow Through Flat Land by Cliff Jones 4 out of 5 Bookmarks! I read the book and I have the link above for you to go and purchase this book available as an eReader from Kindle. I believe in supporting new up and coming authors as well as great books and this book is representative of both. Click the link above, download the book, and happy reading, Dear Bloggites!